Happy New Year! Can you believe that we’re in the year of 2019, already? How time flies! I know that all of you have made big plans for the coming year. But, before you get too busy with all that stuff, let’s take a look at what America was like in 1919. Men had a life expectancy of 53.5 years, and women lived an average of 56 years. The population of the U.S. grew to 104.5 million. Our current population is at about 329 million, with one new person being added every 14 seconds. 6 million motor vehicles were registered in the U.S. Today, we have over 276 million vehicles on the road. 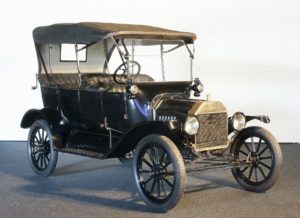 A Model T Ford could be purchased for only $500, and they made over 498,000 of them in 1919. Edsel Ford, the son of Henry Ford, became the president of Ford Motor Company on January 1, 1919. The influenza pandemic of 1918 continued, with the second and third waves occurring in 1919. 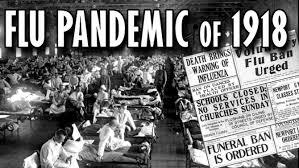 Researchers estimate that about one out of every four U.S. citizens fell ill during this pandemic, and that 675,000 died from it. Worldwide, an estimated 30-50 million died from the flu. The rotary dial telephone was introduced by the American Telephone and Telegraph Company. They were first installed in Norfolk, Virginia. 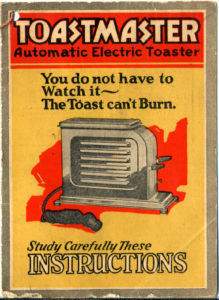 toaster, which is very similar to what we use today. American farmers had an average pay of $43.29 per month, with board. Without board, their average pay was $56.63 per month. If you worked for minimum wage in California, you’d earn $0.28 per hour. The labor participation rates were about 84% for men, and 22% for women. About 51% of young men, and 22% of young women (ages 14-19), also had jobs. Marion Harris had the number one hit song, and it was titled “After you’re gone”. “Miracle Man”, a silent film drama, was the number one movie. It starred Lon Chaney, and grossed $3 million at the box office. The Eighteenth Amendment of the U.S. Constitution was ratified on January 16, 1919. It effectively established the prohibition of intoxicating liquors by declaring the production, transport, and sale of intoxicating liquors illegal. Prohibition was in effect until 1933, when it was repealed. The price of a first-class postage stamp dropped from 3 cents down to only 2 cents! In May of 1919, Navy aviators made the first transatlantic flight in a seaplane. With time for repairs and rest, it took the crew 19 days to fly the Curtis NC-4 from New York to Lisbon, Portugal. Today, a Boeing 787 Dreamliner can fly from New York to London in just over five hours. Only 16.8% of students graduated from high school. On December Babe Ruth was sold by the Boston Red Sox to the New York Yankees for $125,000. That was the largest sum ever paid for a player at that time. Less than 1% of homes in the U.S. had electricity and indoor plumbing. As you can see, life in America has really changed over the last 100 years. Can you even imagine what it would be like to wake up in the middle of the night, light a kerosene lamp so you could walk outside in the cold weather, and go to the outhouse? And, how could you possibly survive without a TV, or smartphone?